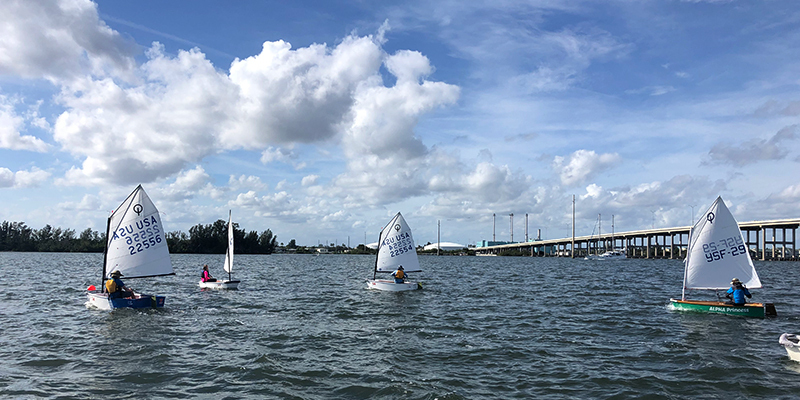 Tom Burnham, an 11th Hour Racing Ambassador, shares details from his recent visit with the Youth Sailing Foundation of Indian River County (YSF), a grantee he supports through 11th Hour Racing. 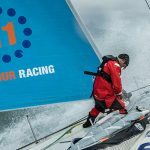 Last year, 11th Hour Racing started a new initiative within its ambassador program. Each ambassador chooses a project with a nonprofit organization of their choice. 11th Hour Racing supports this new initiative by awarding each organization a $10,000 grant. Last month, Tom Burnham visited “his” grantee, the Youth Sailing Foundation in Vero Beach, FL. We caught up with him to hear about his experience and what he learned. Tell us about your visit to the Youth Sailing Foundation of Indian River County. I was excited to visit YSF, I knew I wanted to work with a grantee that focused on getting communities involved in sailing, but I hadn’t been to YSF before. It’s an amazing grassroots organization run by volunteers, focused on getting local kids (150 a week!) out sailing to enjoy the water. Most of these kids would not otherwise be exposed to this sport, and likely would spend little time on this beautiful estuary. I was very impressed by the resourcefulness of the organization: for example, when they needed buses to get the kids to the sailing site after school, rather than fundraising to buy new buses, YSF partnered with a local organization for the homeless that provided a grant to purchase a 25-passenger bus and 15-passenger van. YSF manages the vans, hires professional drivers and transports seventy homeless children each day during summer and school year vacations. 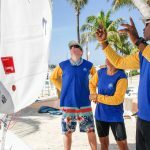 YSF uses the vehicles to pick-up sailors after school and brings them to YSF for free sailing instruction. This ingenuity is a common thread in how YSF manages its operations. Other examples include using a bridge overpass to store the boats out of the rain, building 35 wooden Optimists with a group of volunteers, and buying a fleet of used 420s at a huge discount – cost savings like these enable the organization to keep the sailing courses free. What specific YSF programs stood out to you? Part of this grant is aimed at developing the organization’s special needs sailing program for kids with disabilities. What is particularly inspiring about this project is that YSF is not implementing it as a completely separate program. One of the students from the Optimist program that I got to meet has autism, and it was wonderful to see how he was able to participate in the sailing program together with all the other students. How are the students learning about the local environment? 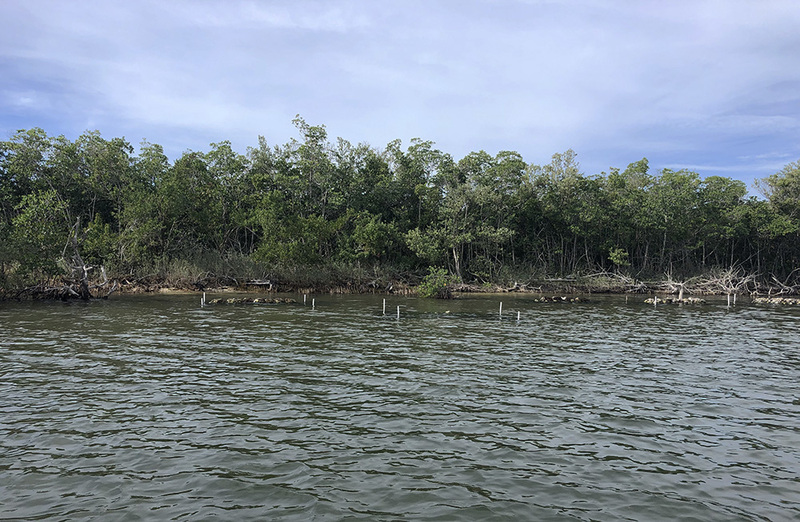 I was surprised to learn that the Indian River Lagoon is one of the most biologically diverse estuaries in North America. What’s even more exciting is that the kids are helping protect the waters they are sailing on. 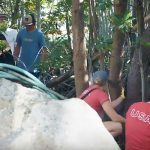 This fall, 75 sailors from YSF helped the Ocean Research & Conservation Association place 18 tons of fossilized shells in the lagoon to construct a living shoreline. The kids sailed loads of shells 3 miles upriver in their boats and helped place them. 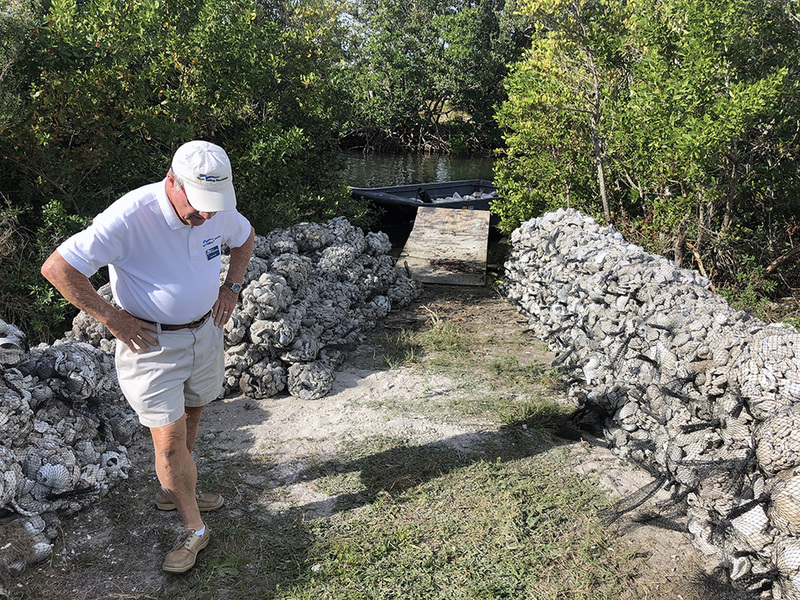 The piles of shells act as natural breakwaters that will buffer human impacts on the lagoon, such as erosion caused by boat wake that damages the ecologically important mangrove forests nearby. The shells also provide valuable habitat for small sea life to renew the ecological cycle of growth. Seagrass is planted around the breakwaters to enhance the habitat. This is an ongoing project at YSF with volunteers and students continuing to sift and bag oyster shells to be added to the 18 tons already in place. 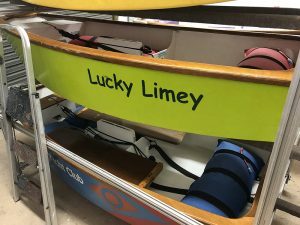 Lucky Limey is one of the wooden Optimist made by volunteers at YSF. 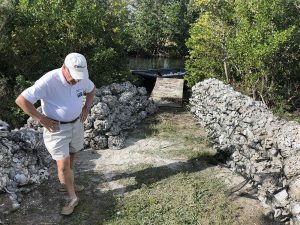 Volunteers and students are helping build a living shoreline using fossilized shells. They already helped place 18 tons of shells. 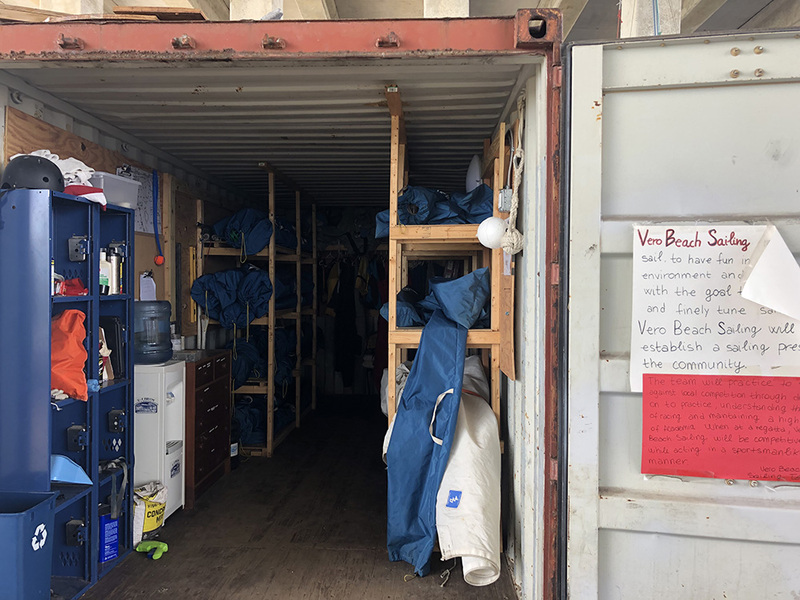 A container makes for a perfect storage unit for sails, and hosts a water filling station so students don’t need to bring single-use plastic water bottles. 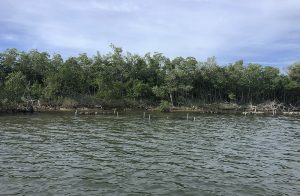 Once placed in the lagoon, the bagged oyster shells protect the important mangrove forests from being damaged by the wake of motorboats.